Over Clocked Remix is a community driven website that provides a place for anyone to upload remixes of their favorite video game music. Music can be downloaded for free from a number of mirrors, but there are several legal torrents that can be used too. Many of the songs are from classic games, so even if you have not played in years, there are bound to be tunes that are both fresh and nostalgic for you. The site clearly has been created by people who love video games. The organization goes so far as to claim that they are "dedicated to the appreciation and promotion of video game music as an art form." Up in the right hand corner you will notice a mascot. That mascot will change with every page reload and you can click on them for more information. They come from a myriad of games and are undiscriminating of systems, as does the music within the site. There are several ways to reach the music within the site. The latest songs are listed on the right. Random songs are listed towards the bottom of the page. You can search for games that may have remixes by name. Typically, games for the NES, SNES, and Sega will a few good songs to choose from, but new games have a growing number of remixes as well. 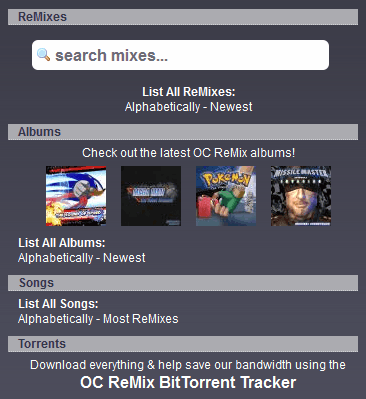 You can list songs by game alphabetically or by number of remixes from the Music menu at the top of the page. You can also go to the torrent page. Torrents are often associated with illegal downloading, but this is an example of legal file sharing. In fact, using the torrents will help the site. How can it do that? Simple: torrents save the site bandwidth costs. The files in the torrents are the same ones that you can download from the site. By using the torrents, the bandwidth comes from fellow users rather than traditional web servers. The torrents have a lot of content. At the time of writing, you can download the first thousand songs, the next nine hundred songs, and twenty nine albums. The albums often come in both MP3 and FLAC (Free Lossless Audio Codec) formats, so the quality of the tracks is high. Chrono Trigger - The Frog Dance : A fast paced, chipper tune (probably house or club genre). It is suitable for a workout playlist. Final Fantasy 11 Online - A Cinematic Heaven : An example of an orchestral song. The sampling may be noticeable to experienced ears, but it still pleasant. Final Fantasy 13 - Blue Skies : An example of a song with vocals, but distinctly techno. Trance influences soften its edges. Super Metroid - In Your Prime : This composition starts off very dark but steadily increases the tempo to a climax. An interesting work. Sonic the Hedgehog - April Rain : A whimsical tune that will evoke nostalgic memories within seconds. The style is a blend of orchestral and techno music. The web site and community there encourage others to try their hand at creating new remixes. They have a variety of tutorials and avenues for feedback. There is a list of software on the Links page (see "Music-Making Software"), but the tutorials are general enough to accommodate various types software and tools. If you wanted to learn how to make music on a computer, this is not a bad community to learn from. If you are interested in contributing and not just consuming, I would encourage you to read the Content Policy. While it does not claim ownership to the uploaded music or anything alarming, they outright specify that they typically do not take down content. Once you post something on the site, it is expected to stay there. While this makes sense for fans, it may not for composers. In general, it is good to be aware of rules like this. With thousands of songs, and several sources to download from, most people should be able to find something to add to their MP3 collection. Enjoy the music. Let us know in the comments if you find a song worth downloading.